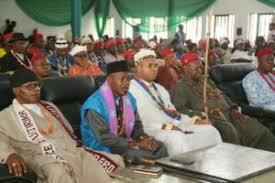 ABIA– Traditional rulers representing the three communities in Afaraukwu, Umuahia North Local Government Area of Abia State, the hometown of the leader of the Indigenous People of Biafra, IPOB, Nnamdi Kanu, have petitioned President Muhammadu Buhari, demanding an urgent initiation of a full-scale investigation to ascertain the role and extent of damage incurred during the invasion by armed Nigerian soldiers at the palace of His Royal Highness, Eze Israel Kanu. The revered monarchs in the petition to Buhari which was signed by the President-Generals of the three autonomous communities in Afaraukwu– Levi Ogbonna, Cletus Uwaechi and Chief Ikechukwu Ndubueze, noted that since the military invasion at Kanu’s home, neither HRH, Eze Kanu, his wife, Lolo Sally nor any of their immediate subjects has been seen or heard. “That since September 14, 2017 the whereabouts of one of our traditional ruler, HRH Eze I. O. Kanu, and members of his family, including some members of Isiama Afaraukwu community, are still unknown,” part of the petition reads. The monarchs who urged Buhari to initiate prompt action into the matter, further alleged that some members of the community were still missing since the military raid, expressing fears that they might have been killed and their bodies taken away to an unknown destination by the military along with members of IPOB. The autonomous communities, Okwulaga Enyiukwu and Isiama, insisted that the army should be made to produce their traditional ruler, whom have since gone missing after the raid. Also part of their demands, included full compensation for the brutal and mindless desecration of the palace and the return of household items allegedly carted away from the palace by the soldiers.